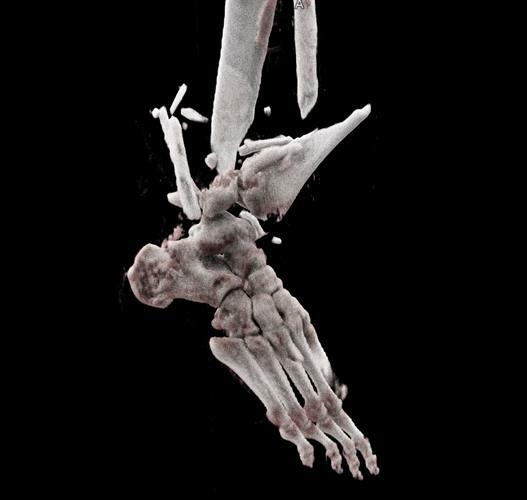 August 20, 2018 -- Cinematically rendered images based on CT scans of the ankle are more photorealistic and depict relevant findings better than conventional volume-rendered 3D reconstructions, according to an article published online August 14 in the American Journal of Roentgenology. Cinematic rendering is an advanced visualization method involving complex lighting models that simulate light and shadow to photorealistically display the anatomical structures of CT scans. Various groups have demonstrated the technique's potential to improve the clinical management of intricate cases such as acute aortic injury and highly vascularized kidney aneurysms. Cinematically rendered image of ankle fracture. Courtesy of Dr. Wolf Schweitzer from the University of Zurich. In the current study, researchers from Switzerland, led by first author Dr. Florian Berger of the University of Zurich, acquired the imaging data of 10 patients who underwent CT exams for different types of ankle injuries. The investigators reconstructed the CT datasets as 3D images using a conventional volume-rendering technique and a cinematic-rendering technique. They performed volume rendering at a multimodality workstation (syngo.via VB10B, Siemens Healthineers) and cinematic rendering at an external workstation equipped with prototype software (syngo.via Frontier, Siemens). All of the 3D reconstructions had similar field-of-view, perspective, and opacity settings. The shadowing and depth-of-field effects of the cinematically rendered image (right) minimize the distraction caused by background structures visible in the corresponding volume-rendered MR image (left). Image courtesy of AJR. After randomizing both sets of images, the researchers presented the 3D images to 12 radiologists and 10 orthopedic surgeons for subjective evaluation. The physicians compared the volume-rendered and cinematically rendered images and chose which one offered the best visualization for each type of injury. Overall, the radiologists and surgeons preferred the cinematically rendered images for the majority of the 10 ankle injuries (p < 0.005). However, there were a few injuries -- mainly those not involving fractures -- for which the physicians favored conventional volume-rendered images or considered both imaging techniques equally as good. Realistic shadowing. 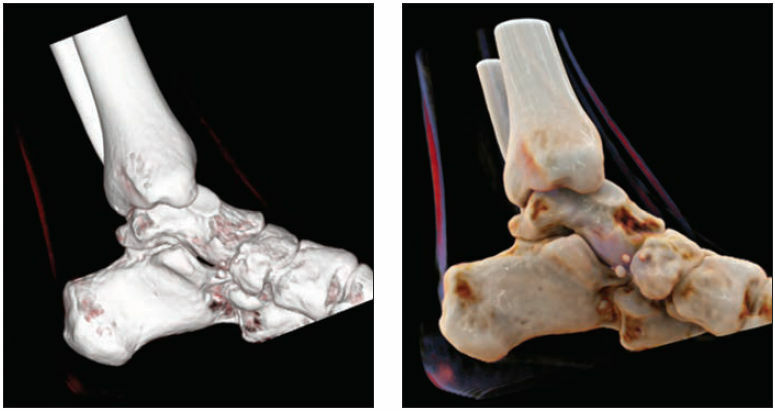 For instance, the shadowing of the Weber C ankle fracture gives the cinematically rendered image a more natural depth and more clearly depicts the individual bony structures, Berger and colleagues noted. Depth-of-field effects. Cinematic rendering's depth-of-field effects help minimize distractions and, thus, better represent minor findings. Perception of soft tissue. Unlike traditional volume rendering, cinematic rendering enhances the perception of soft-tissue structures, which could help in the representation of ligament or muscle ruptures in radiology reports. However, the authors also mentioned two drawbacks to cinematic rendering: the potential for realistic shadows to hide certain parts of images, such as fracture gaps, that are usually well lit in standard reconstructions, as well as a long processing time. "Cinematic-rendering technique may play an integral part in preoperative 3D examination of fractures and dislocations in clinical routine," they concluded.